Own and manage 300+ static faces throughout Utah, Idaho, and Arizona. Several freeway bulletin spectacular options across the Wasatch Front. One of the largest providers of digital ad space in Utah. 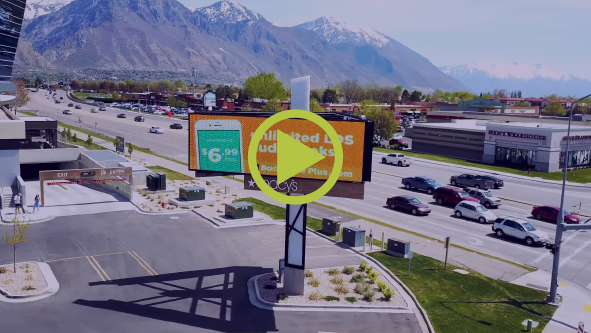 Own and manage digital faces from Provo to Bountiful strategically located at congestion points in Salt Lake City Metro, Utah County, and Northern Utah. Mall marquee faces at three different major Utah malls. 6+ New locations planned for 2017 from Layton to St. George. Iconic 15+ foot wayfinding signs with 4’ x 11’ vertical adspace. Located at congestion points for pedestrian and slow traffic. Check out our new RoadTops at Falcon Hill at Hill Air Force base. Eighteen new signs available now at University Place Mall in Orem.